Bygone Living: Aqua Grill, and B&B Friday (5/28/10)! Aqua Grill, and B&B Friday (5/28/10)! "Aqua Grille is a cozy waterfront bistro and bar with dining on an all weather, open air deck overlooking both the Sandwich Marina and the Cape Cod Canal, a favorite eating and drinking spot for locals as well as visitors for its colorful location with fantastic views." 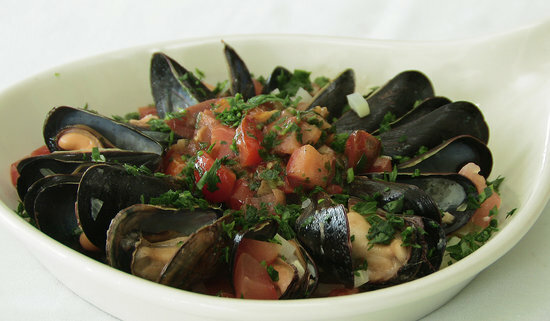 "Much of the seafood served at Aqua Grille comes right off the fishing boats that dock within steps to the Aqua Grille along the Cape Cod Canal and the affordable new American menu is well rounded and delivers with local freshness and worldly flavors." restaurant snapping away with their camera the entire time! "Concord's Colonial Inn is an enduring landmark of gracious hospitality in historic Concord, Massachusetts. The Inn was originally built in 1716 and has operated as a hotel since 1889. Nestled in a quaint New England village famed for its revolutionary and literary history, Concord's Colonial Inn is the picture perfect destination for your next vacation." The inn might also be... haunted! "I have always prided myself on being a fairly sane individual, but on the night of June 14, I began to have my doubts. On that night, I saw a ghost in your Inn. The next morning I felt too foolish to mention it to the management, so my husband and I continued on our honeymoon. I wondered whether or not any sightings of a ghost had been reported or if any history of one was involved in the history of the Inn. For the remainder of the night, I could not fall asleep. It was spent trying to conjure a logical explanation for the apparition. It was not a reflection of the moon as all the curtains were completely closed. 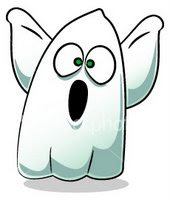 Upon relating the incident to my husband, he said the ghost was included in the price of the room." 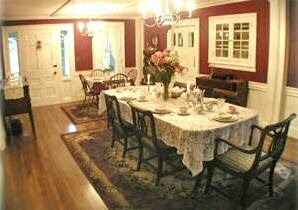 "Welcome to Elm Cottage B&B, Searsport's only vegan/vegetarian bed and breakfast. 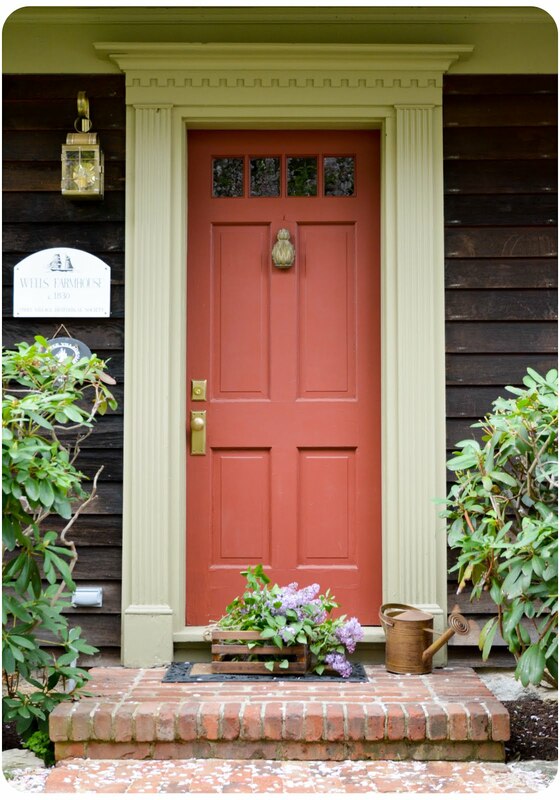 Elm Cottage Bed & Breakfast is located within sight of Penobscot Bay in the historic district of Searsport. Retreat into the warmth and charm of this beautiful 1840 home, only steps away from the town park and beach, Penobscot Marine Museum, antique stores, art galleries, restaurants, Left Bank Books, and more." "Welcome to White Rocks Inn Bed & Breakfast, where you will experience the warmth and charm of Old Vermont on a historic dairy farm. This is a Vermont bed and breakfast at its best, the way you always dreamed it would be. Located on the historic Ethan Allen Highway, the farm beckons with the architecture of its elegant Greek Revival farmhouse and landmark Gothic barn. This idyllic pastoral scene in the heart of the Otter Creek Valley, nestled between two mountain ranges, has offered escape to travelers since 1983. The house is surrounded by ancient trees—sugar maples, white pine and black walnut. It offers spectacular views of the Green Mountains—the bleached boulders of the White Rocks Recreation Area cascading down the hillside. In whatever season your travels bring you to Vermont, you will find a haven of peace and tranquility at White Rocks Inn. Whether you come for New England fall foliage, a romantic getaway, a country wedding, or for all-season outdoor activities and beautiful scenery, you are sure to find the best that Vermont has to offer waiting just outside your door." Have a fabulous trip and enjoy that marvelous view! First of all I love all the B&B's you shared...and secondly..I'm so jealous!! Enjoy yourself and have fun! I've always wondered about the White Rocks Inn when I've driven by it. Thanks for posting the photos and info. Looks like a nice spot. I think I might have to check out that restaurant in Sandwich. I've had tea and brunch at the Colonial Inn and it is very nice. in Harwich. I am going there with friends. Cape Cod is beautiful! we have gone there a couple of times and i would love to go back. Thank you for all your sweet comments on my blog. OH, I bet you can't wait for your trip! I love the B&B's, so gorgeous! I would love to go back to New England, such a gorgeous place! And please do snap away in the restaurant..., and post all the pictures!! !